Beautiful Incentives: 3 healthy habits I picked up in the past few months. 3 healthy habits I picked up in the past few months. Products mentioned have been supplied to me for free, in exchange for my honest review. Affiliate links may be contained within. I never recommend anything that I wouldn't use myself. It has been quite a while since I last blogged. A lot has transpired since then, like turning 99% plant based, starting therapy for my chronic pain and autoimmune disease. Plus, my first kidney stone thrown in there. I have never felt pain like I felt then. You think you have felt the worst, until that. In an effort to bring my health up to speed and possibly, hopefully, for the love of all that is good, prevent another kidney stone, I have incorporated some new changes into my life. Specifically in diet, body and mental health. Being in my mid 30's has really put things into perspective for me. I have been living too sedentary and although i've been healthy, not healthy enough. Even when you eat healthy, being as sedentary as I was, would negate all benefits of that in the long run. 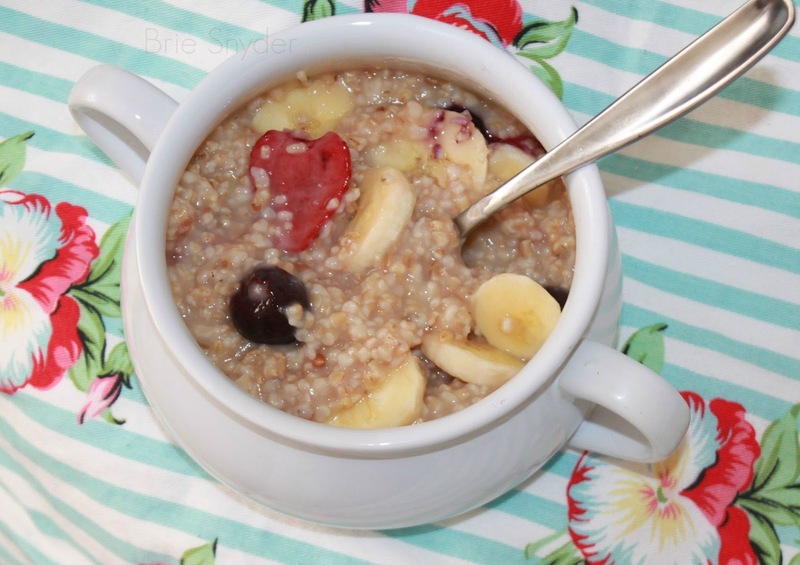 Photography by: Brie Snyder - "I heart oatmeal"
Turning 99% plant based has been really beneficial to me in terms of skin, body and mental well being. I have a lot more energy, have lost 27 pounds and going, and my skin is much clearer. It's been quite a challenge at times to get to where I am, but it was definitely worth it in the end. However, I do sometimes miss the convenience! The convenience of those foods was unbeatable. You have to make everything from scratch and i've never done so much chopping in my life. These are all good things though. Even with chronic pain as bad as mine, it helps to keep myself moving and busy. We were meant to make things, not have them made for us all the time. 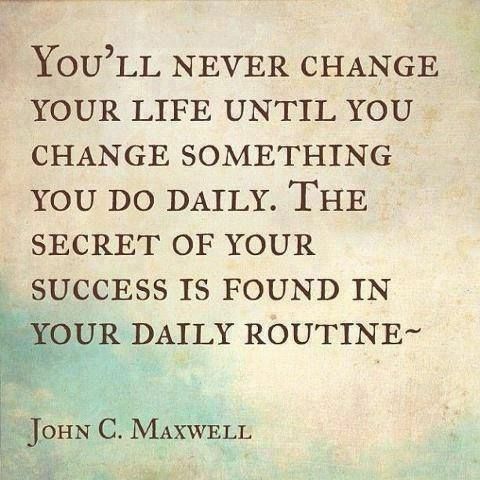 And there is a refreshing power you get when you have control over what goes into your body. So many foods today are like foreign objects to our system. Since turning plant based, I have incorporated a few necessary vitamins into my daily and weekly routine. One of the most important, being Vitamin B-12, which comes easiest through meat and dairy, but even many people who eat meat still may not get enough. You also start to produce less of it, the more you age. So everyone should take B-12 and you can never have too much. Right now, I take a sub-lingual and have just started to incorporate gummies for extra support. 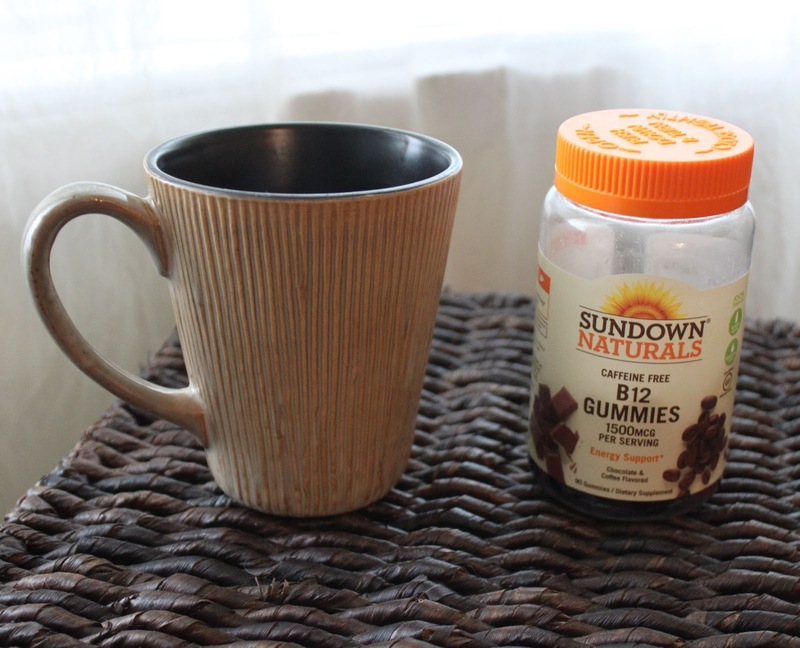 The brand i'm using now is Sundown Naturals and they have the flavor of chocolate and coffee, so they go great with my morning Cupa. These gummies are free of caffeine, milk, wheat and many other nono's, but they are not vegan. I strive to find only vegan, plant based vitamins, but they will do for now, as I received them free to try out and am still transitioning. Sundown Naturals also carries a vegetarian B-12 sublingual, which is Gluten free as well. In addition, I started taking Melatonin gummies by the same company. A restful sleep is so important for me. I have recently taken up Yoga again for the health of my body as well as mind. It helps my pain, it's a great stress reliever and really relaxes you. I also try to meditate some, while doing this. 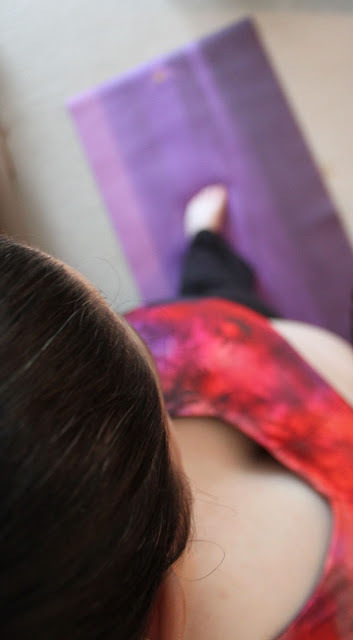 It is the perfect time to let go just lying there on my comfortable Yoga mat. 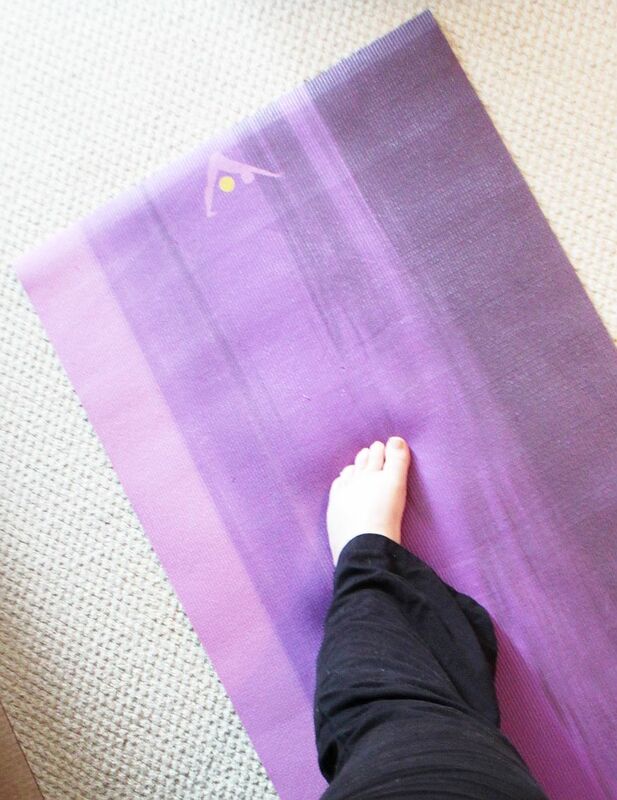 This one I have had for a while and am absolutely loving is the Aurorae Printed 5mm Thick Yoga Mat The one I chose is a vibrant purple called Energy, with a sort of ombre effect, meant to mimic the Northern Lights. It is gorgeous and thick and has REALLY stood the test of time over years now. So if you want a reliable, comfortable, very large, eco friendly and affordable yoga mat, I would recommend them. I also like to use the Aurorae Lavender Spa mist and candle It really does aid in the relaxation effects. The third and last change I have made is something you might find a given for you. I started using a sonic electronic tooth brush. 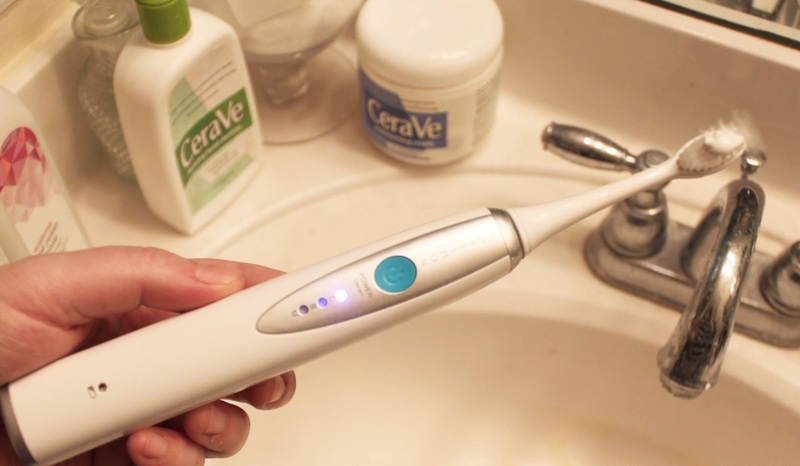 Yup, I am probably the last to jump on board the whole fancy electronic tooth brush train. I'm glad I did. My gums have been thanking me ever since and my teeth have never felt so clean and pearly feeling. I never got this kind of clean with another brand of a very cheap electronic toothbrush, nor my regular brush. I am now a firm believer that everyone needs one. It is like a massage for your teeth and gums. When we say full body massage, it should include our face and teeth. Pictured, is the Poseidon Rechargeable Sonic Toothbrush . It has a sleek and inconspicuous decor friendly design. Perfect for my porcelain white sink area. This guy has a fast charge and 3 different settings for speed. It also comes with extra brushes. So far, it has been very reliable and it's been many months. I'm actually not kidding when I say I enjoy brushing my teeth a lot more. It's faster and more comfortable than ever before. They also have a new Poseidon Oral Irrigator that I'm curious about. I've never used one. Oh, the things that exist in the wonderful world of oral hygiene. Those are the 3 big or small changes I have made, depending on how you view it. To me, they are significant changes I will definitely keep around and I know there will be more to come.